[[underline]]H.U.D. INVESTIGATION OF CITY OF DES MOINES[[end underline]] Steve Rocha The city of Des Moines has been charged with denying equal employment opportunities to Chicanos and failing to assist Chicanos through federally funded programs. In December, 1972, an investigation team from the U.S. Department of Housing and urban Development spent four days in Des Moines. Mrs. Blanca Trevino, equal opportunity specialist with HUD in Washington, D.C. and others met with mayor Olson and his officials. Olson and his staff denied the charge by referring to Mrs. Trevino to local Mexican American "leaders", who denied the existence of any problems in the Chicano community. Heriberto Zamora, who had complained to HUD, led the officials on a tour of 15 Chicano homes in the Southeast Bottoms area, where many of Des Moines' Chicanos live. Mrs. Trevino found unpaved streets, no sewers, and some homes with no indoor plumbing. Mr. Zamora's chief complaint was against the city's Community Development Program, the local revenue sharing agency. The Community Development program, with a budget of 1.5 million, serves six areas of the city. 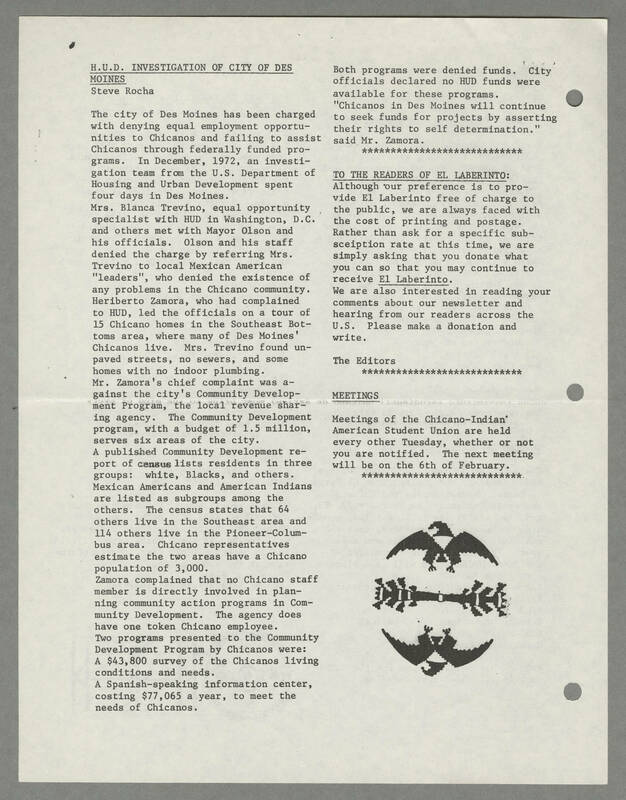 A published Community Development report of census lists residents in three groups: white, Blacks, and others. Mexican Americans and American Indians are listed as subgroups among the others. The census states that 64 others live in the Southeast area and 114 others live in the Pioneer-Columbus area. Chicano representatives estimate the two areas have a Chicano population of 3,000. Zamora complained that no Chicano staff member is directly involved in planning community action programs in Community Development. The agency does have one token Chicano employee. Two programs presented to the Community Development Program by Chicanos were: a $43,800 survey of the Chicanos living conditions and needs. A Spanish-speaking information center, costing $77,065 a year, to meet the needs of Chicanos. Both programs were denied funds. City officials declared no HUD funds were available for these programs. "Chicanos in Des Moines will continue to seek funds for projects by asserting their rights to self determination." said Mr. Zamora. [[underline]]TO THE READERS OF EL LABERINTO[[end underline]]: Although our preference is to provide El Laberinto free of charge to the public, we are always faced with the cost of printing and postage. Rather than ask for a specific subsceiption rate at this time, we are simply asking that you donate what you can so that you may continue to receive [[underline]]El Laberinto[[end underline]]. We are also interested in reading your comments about our newsletter and hearing from our readers across the U.S. Please make a donation and write. The Editors [[underline]]MEETINGS[[end underline]] Meetings of the Chicano-Indian American Student Union are held every other Tuesday, whether or not you are notified. The next meeting will be on the 6th of February.